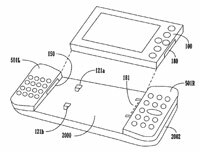 The Technologizer blog has published an interesting pictorial gallery of a number of Palm ideas that made their way through the USPTO. Looking though Palm's patent archives following the big sellout, the site has put together a quick look at 11 different Palm product concepts that apparently never made it off the drawing board. A browse through shows off some intriguing Palm handheld product concepts, some dating from as far back at this smartphone design from 1998 which half resembles the old PDQ. A number of other unique concepts can be found such as a horizontally sliding PDA with a keyboard and a removable PDA that links up with a thumb keyboard sled from 2004 (pictured at right). Notice that the Roteo is not on the list. I can only assume that she's still alive and in the pipeline. Hehe! All of these designs look like dogs--even in the days of the Vx. Palm Patented the New iPhone? This patent involves a Webcam-equipped, multimedia-enabled PDA that permitted for videoconferencing and WebEx-like online meetings. Neat–and probably a tad ahead of its time given that the patent dates to 2002, before the dawn of 3G broadband and modern smartphones. Even in 2010, I'm not sure if we have anything quite this ambitious. Actually the "stolen" iPhone prototype that made the rounds last week has just such a front mounted camera, presumably for Skyping on the go or some video chat service for which AT&T will charge $29.99 a month. Virgin Mobile/Sprint drop a bombshell on the industry! ■The revolutionary $25 plan is the industry's lowest price point for unlimited messaging, email, data and web with 300 minutes of voice per month, ideal for high-end device users seeking an unbeatable price to enable the text and data services they need. ■The $40 plan includes unlimited messaging, email, data and web with 1,200 minutes of voice per month — the perfect value for those seeking an affordable plan with everything they need. ■The $60 plan includes unlimited messaging, email, data and web with unlimited voice to offer great value for high-end smartphone users expecting an unlimited plan to cost much more. This is PRECISELY what should have been available 1-2 years ago on a Palm Inc. device (or ANY halfway reasonably spec'd smartphone). Data-centric + unlimited data + no contract=MEGA WIN. 1. Unload all of those unsold Sprint Pre & Pixi ASAP at $200ish & 300ish at retail and make 'em compatible with the new Virgin plans. This would be perfect for the Mike Cane types. Heck, I'd probably even consider purchasing a WebOS device at that price point with cheap, no-strings, no-contract monthly service attached. If Palm won't sell us a "Pre Touch" non-phone device, then the above solution would be a reasonable replacement. 2. Unload any excess GSM WebOS devices on T-Mobile and market like crazy the fact that Palm products are available on all 4 major domestic carriers. That's something only RIM can reasonably tout. Due to the horrible fragmentation of Android, one's Android experience on one carrier (T-Mobile with a bunch of old, lame, low-end Android 1.x handsets alongside the "unofficial" Nexus On) will contrast sharply to what's available on another (Verizon with the current best of the bunch Droid & Droid Incredible). A seamless WebOS experience from one carrier to another could be a major WebOS selling point. RE: Virgin Mobile/Sprint drop a bombshell on the industry! Gee, that's almost as good as my 850 minutes, $4.50/month plan I have in Hong Kong. Seriously though, this is EXACTLY the kind of competition that is long overdue in the US market. Will you keep my name OUT of these effin posts? Settle down, it's not an insult. It's my catch-all term for people who do not need/want a pricey monthly service plan and/or contract. Is there a particular buzzword I should be aware of to use instead? Wireless nomads, perhaps? I quite frequently deal with business travelers who are in the USA from anywhere from a few days to a few weeks or even a month at a time. Most of them are consultants and/or self-employed so they cannot write off $3000+ in wireless data to their employer. Their line of work doesn't take them here often enough to warrant having a monthly phone bill in the USA but they would gladly pay $300 or so for a prepaid smartphone to use primarily for prepaid data while here so they don't have to run around looking for hotspots or pay a fortune in global data roaming. I predict this is gonna be a BIG success (at least as far as success is measured for prepaid phones & services). BTW, I have set up several Virgin Wireless flipphones for international travelers in the past and I have to admit that their voice coverage isn't quite as thorough as I'm used to from Verizon. I think Virgin only uses the Sprint network and will not roam on Verizon etc. I agree...this could be big for international 'roamers'. $25/month for unlimited data....heck this is easy to justify even for infrequent visitors. If it was GSM, one would not even need to buy a second smart phone as a SIM card will do. The people of Palm helped to shape the handheld industry with their thoughts. One can see current technology in the thoughts of Palm employees. These thoughts were valued enough to be acquired by HP to form yet a bigger environment for Palm to work within. Not all ideas will get to market just as not all oil wells produces oil. Though some ideas require adequate funding to determine if or when an idea goes to the public. Some concepts need prototype to build to show people the thoughts. It is in the prototype stage that decisions are made to go forward or not. This is the time when feedback is needed to shape the final product. Some do not understand that R&D is not free it cost much time and money to develop new concepts which is why some get concerned when such thoughts are developed without trade. Advanced economies such as the West and our trade partners trade in thoughts. From a thoughts comes a concept from a concept comes the prototype from the prototype comes the finished product. To exclude the R&D cost by going directly to the manufacturer without including the thoughts is much like theft. If one person starts the cycle of theft then this create a negative trade for all involved. Trade starts with thoughts and must not exclude the thoughts of the people that shared their thoughts. The beauty of technology today is that we can include all thoughts and assure no one is left behind in the process of offering more choices. As an example one should be able to enter we-com virtual wallet in a search engine and find all the people that shared their thoughts. These people own their thoughts and have risked that their time is of value too. Advanced trade in complicated to do correctly. Just some thoughts to expand upon.